I wanted to create some good calorie boosters aka boredom busters for our chickens and turkeys. Jim and I decided to use the fat from our butchered pig along with various grains. 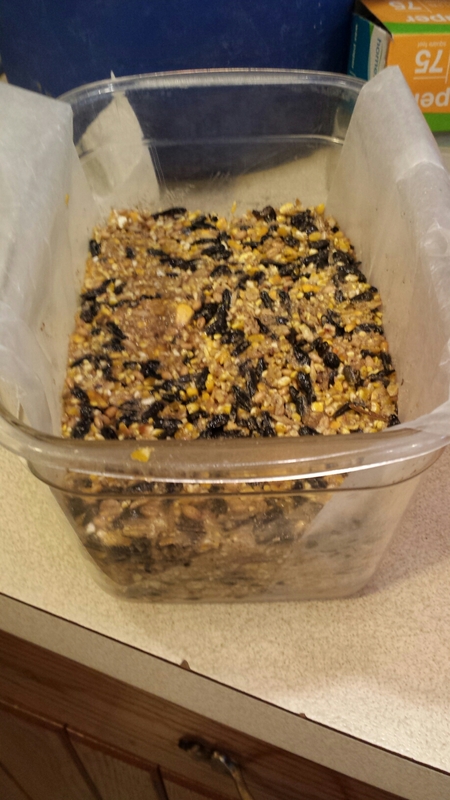 I chose black oiled sunflower seeds, cracked corn, scratch grains and then filler. I found oatmeal pancake mix that had not been a hit with the kids as well as bulk oatmeal that has been around a while. I looked around online and saw interesting articles by folks who also were including herbs. I checked the cupboard again and found the oregano that I normally sprinkle in the food and dried dandelion for teas. I cooked the fat down and did equal parts of all bulk ingredients of 1 cup of each with 2 TB of the herbs. Cooking the fat is also called rendering. All the ingredients were stirred and pressed into bread pans or whatever I had around. I can say that the thing I’ve learned now that I’ve shared these with the birds is that putting wax paper to ease the pressed and solidified cakes out of the pans is very helpful. I pressed the ingredients into the pans and repeated the process a dozen times. In order to not have the fat stay sift, I stored all the pans in our garage where it’s below freezing here in NE PA in January. The birds are getting a chunk every few days and the suet has been a hit. Great ideas that will make a difference!